Recycling is not only earth-friendly, it’s budget-friendly too, so there’s no better kids’ craft material than recyclables! Empty soda bottles can become tiny terrariums, old magazines can be turned into paper mache, and egg cartons can transform into crawling critters. In this case, we made a friendly little crab from an empty egg carton and a few craft supplies. 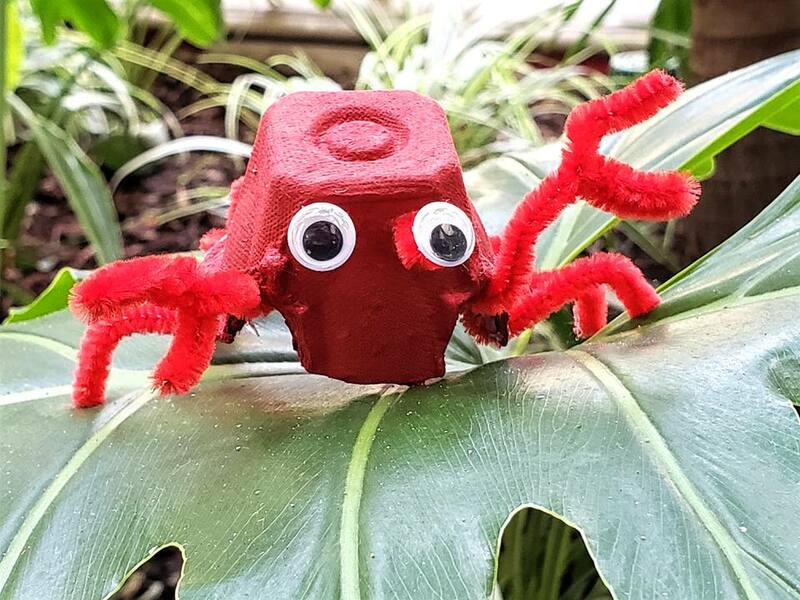 Learn to make this cute and easy crab yourself, and get creative attempting a few more aquatic creatures of your own design! In addition to an egg carton, you'll need a few basic kids' craft supplies to create this crab. While little ones will have fun attaching fuzzy crab claws to bring their critter to life, they'll need some help with the first few steps of this project, especially when precise cutting is required. Carefully cut one cup away from the empty egg carton. A sharp pair of scissors can definitely work here, but may take a little more finesse than a precise craft knife. Adults: this is the one step you’re definitely in charge of for this craft. Cut away any excess paper, creating a circular base. As always, use care when employing a sharp craft knife, and be sure to put the tool away and out of reach as soon as you can. On a craft surface, paint the egg cup (both inside and outside) in a crabby color. We selected a muted brick red, but summery peach or inky blue work too. Be sure to coat the cup evenly, then set to dry as you proceed to the other steps. This will be your crab’s body. While the paint dries, cut your pipe cleaners to size. You’ll need eight leg-sized lengths (about 1-1/2 to 2 inches), 2 bits cut for claws (give yourself 4 to 6 inches of length here—you’ll bend the wire to shape the claws), and 2 shorter lengths (a 1/2 inch each) to create bugging-out eyes. Glue the eight legs to the underside of the painted egg cup. If you’re using hot glue instead of craft glue, make sure an adult holds the glue gun and little hands stay far away from the melted glue or hot metal tip. Space the legs symmetrically, so that there are four on each side of the crab body. Bend the longer lengths of pipe cleaners into pinchers: about three quarters of the way up, fold the wire back onto itself, then twist to secure. You should now have a Y-shaped wire. Curl into grabby claws! Dab a bit of glue onto the end of each of the shortest of the pipe cleaners, then press on a pair of wiggle eyes. You may want to break out the hot glue gun at this point, especially if your kiddo is anxious to bring the crab to life. Once set, adhere the googly eyes to the body with another dot of glue each. Using a generous amount of glue, stick the claws to the underside of the crab body. These should be placed at the front of the animal, nearest the end where you’ll add the eyes. You may need to prop the claws up while the glue sets. Add your crabby creation to the sandbox or craft table for a fun addition to playtime, or attach a loop of fishing line to hang him up as decoration in an ocean-themed kids’ room. No matter where you place him, this crab will bring a smile to your little one’s face. Encourage the kids to create a dozen egg cup creatures next craft time, think: octopi or caterpillars or ducks!